It's amazing how far games like Braid and Limbo have been able to push the boundaries of the 2D platforming genre. It seems like at least a couple of games a year manage to make the decades-old tropes feel relevant again with just a slight tweaking to the rules or change of setting. 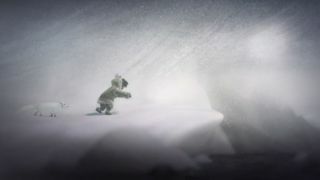 Never Alone, a platformer featuring an Alaskan Native girl and her Arctic fox, looks like it might accomplish that this year. Never Alone is developed by Upper One Games, Based in Anchorage, Alaska. According to its website , it's the first indigenous-owned video game developer and publisher in the US. You play as a young Iñupiaq girl and her adorable Arctic fox companion as the two embark on a quest in the Arctic and beyond. You can see the pair helping one another get around obstacles in the trailer in familiar, puzzle-solving gameplay, but it's really the presentation the stands out. The frigid, sparse, Alaskan environments are beautifully rendered, and Upper One Games says some of the more fantastical imagery is drawing on stories that have been handed down for thousands of years. It looks like a unique game from a new voice and that's always great to see. I'm looking forward to checking it out when it's released this fall.